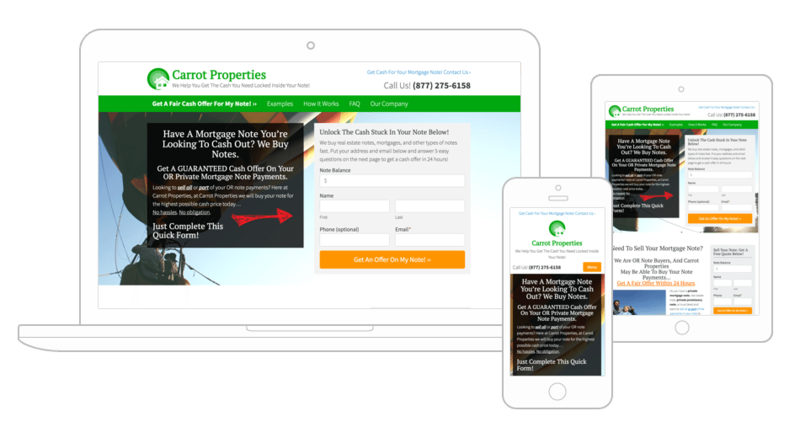 At Carrot we help thousands of real estate investors and agents get a better ROI from their online marketing. See how we can help you attract and convert all types of real estate leads below. Are you a real estate agent? Carrot helps real estate agents attract residential seller and buyer leads and establish yourself as the credible expert in your market. We help you control the online conversation in your market with our industry-leading content marketing tools, our SEO innovation that helps more Carrot clients control top of Google rankings than any other real estate platform, and our high converting websites with IDX. Stop losing leads and listings with an under-performing website. See how AgentCarrot can help you today. Need more deals and are tired of the competition with other marketing? 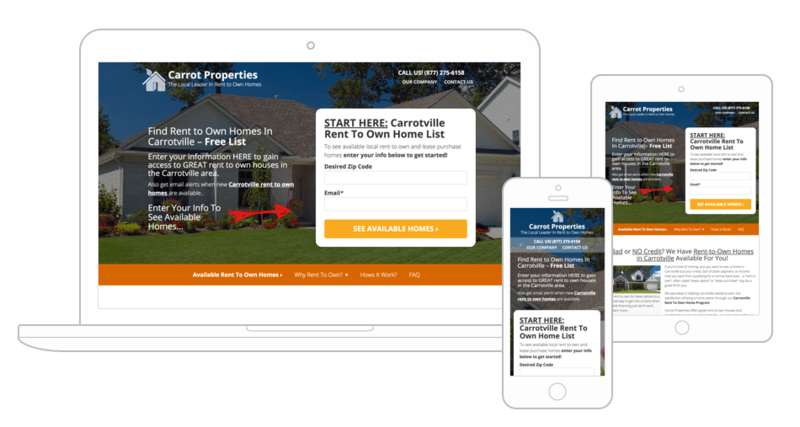 Attract off-market highly motivated house / note / and land sellers with the most effective real estate investor websites in the industry. Launch a motivated seller website today! Just choose the type of lead you’re looking to attract, launch that site (in under 8 seconds), customize, then roll! Sell your properties faster with our simple Property Listing Engine and build a more powerful cash property buyer list. Launch a Cash Buyer Website in your InvestorCarrot account, customize and brand it around our high performing framework. Fill your rent to own / lease purchase houses faster with our Rent To Own Tenant Buyer websites. Convert more visitors into qualified leads and let our system separate the serious tenant buyers from the tire kickers with our built in “2 step” qualification process. According to studies, over 81% of people research online before making a big financial decision. What are they seeing about you and your company when they do? Our Main Company Credibility websites help give you a proven effective framework to build credibility online and ensure you’re putting your best foot forward every time. 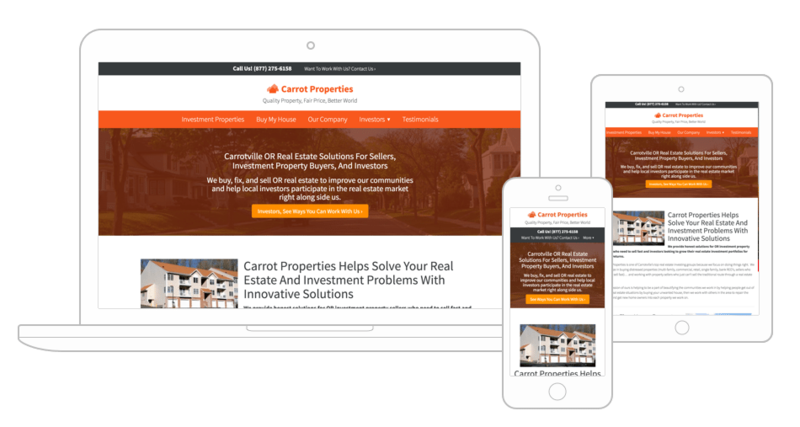 InvestorCarrot isn’t a “real estate investor website” template business. 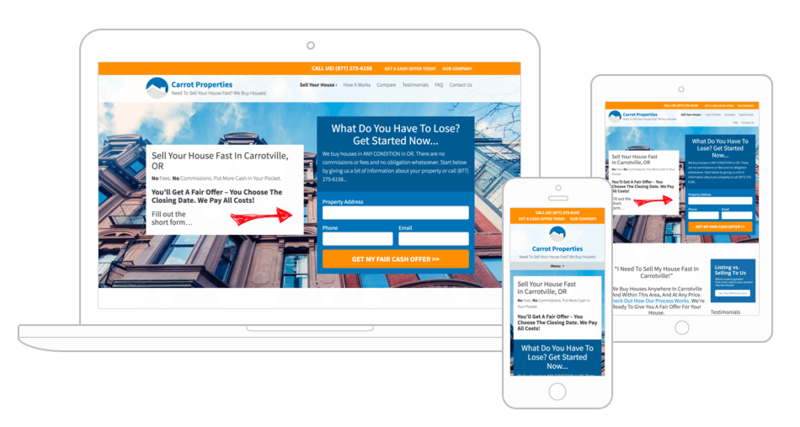 We create software, training, and amazing client experiences so you can grow your business online… whether you’re flipping houses and need buyers and sellers, a note or land investor, rent to own investor, even hard money lender. Flipping bare land is an effective way to invest in this market without the cutthroat competition that the housing market often has. Leverage our expertise to attract and convert more motivated land sellers and cash buyers for your land flipping business. 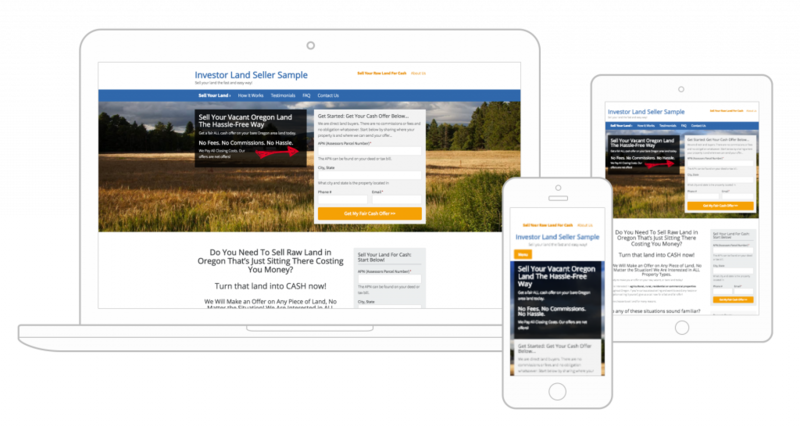 If you are looking to buy and sell land we have a template that has all of our SEO and conversion tools built in. 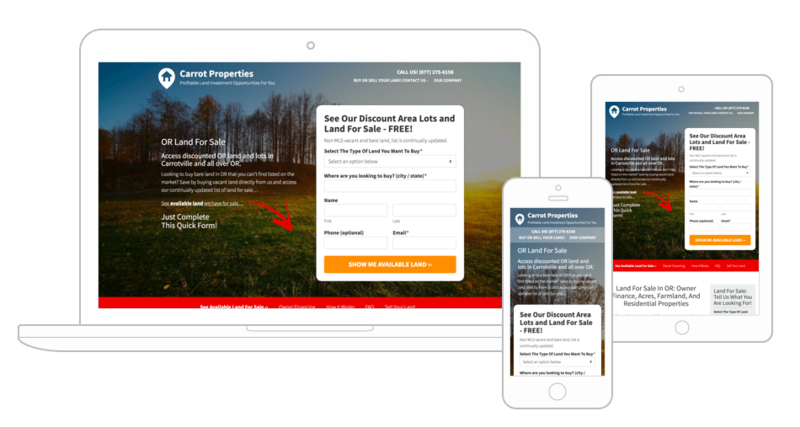 Looking to add another lead generation method to your mix to find more off-market land deals? 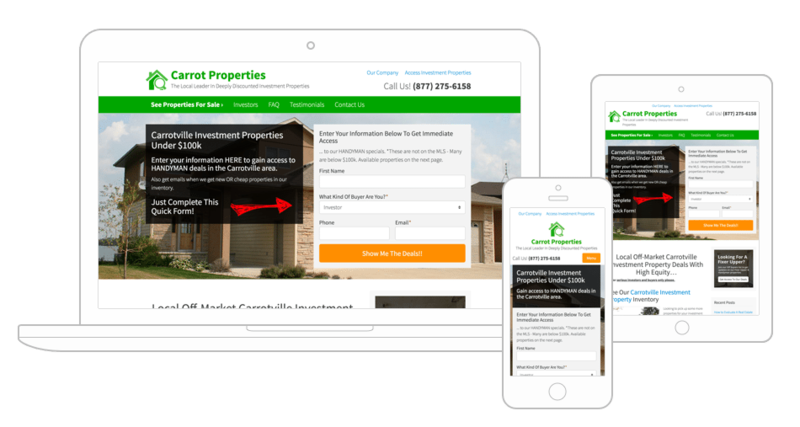 Carrot allows you to launch a website to target people looking to sell their land. 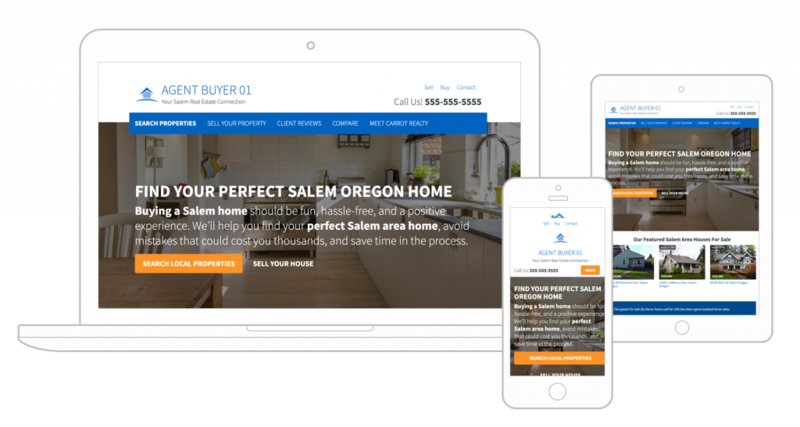 Launch the website, personalize it, and drive traffic to your new Land Seller website. If you are looking buy land we have a template that has all of our SEO and conversion tools built in. If you sell properties by owner finance and are looking to build up a list of potential buyers looking to find local owner finance housing deals, our Owner Finance website system can help you. 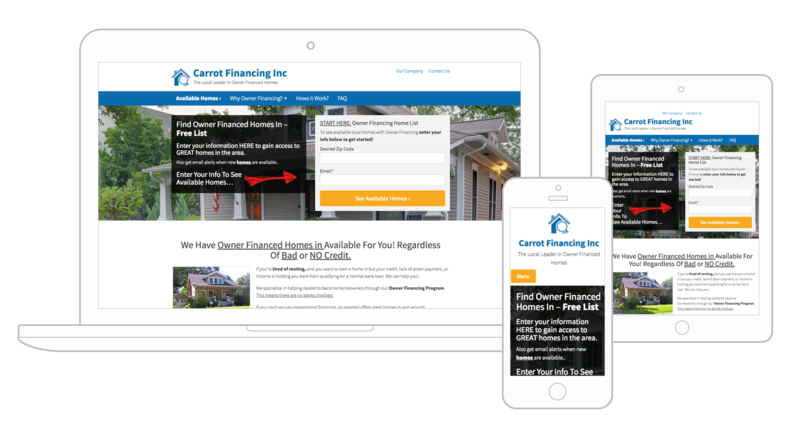 We’ve collaborated with some of the largest owner finance investors in the country to craft a website to help you attract and convert more owner finance buyer leads + list your properties for sale easily at the push of a button. 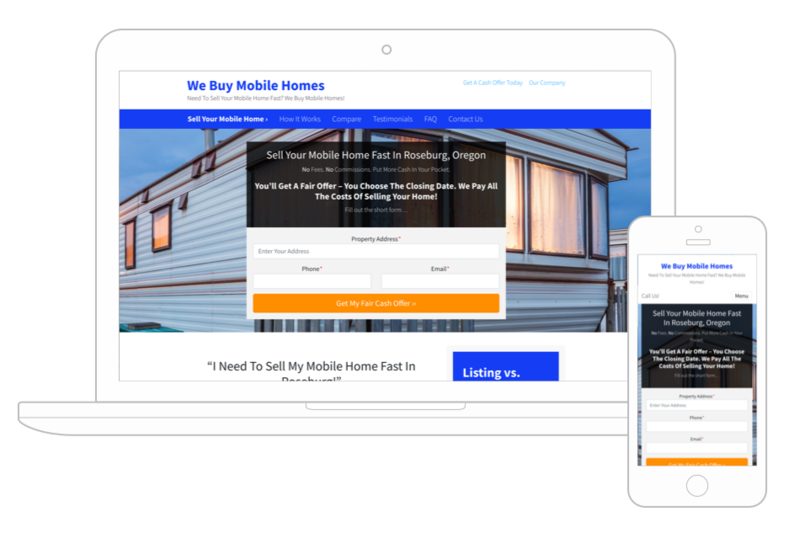 If you are looking to buy discounted mobile homes then look no further than our mobile home websites. These sites are designed to attract and convert leads looking to sell their manufactured homes for a discount. You are able to rehab them or flip them as you see fit.